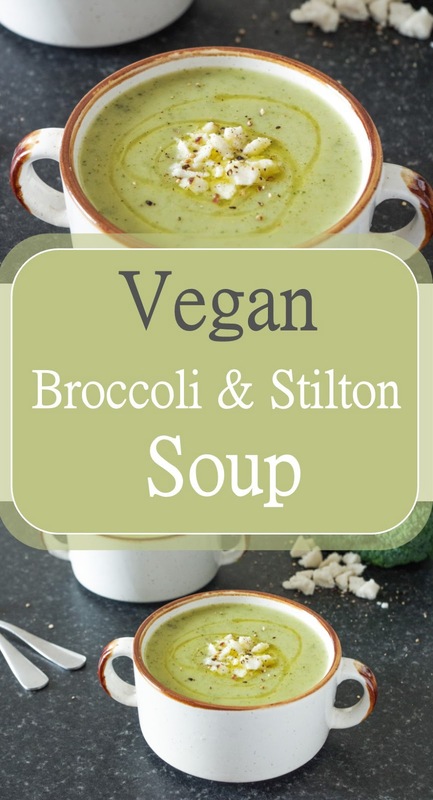 I mentioned a few weeks ago, when I tried the new Violife Blu that it would be great in a broccoli and stilton style soup, though at the time, the weather was beautiful and it was hardly soup weather. 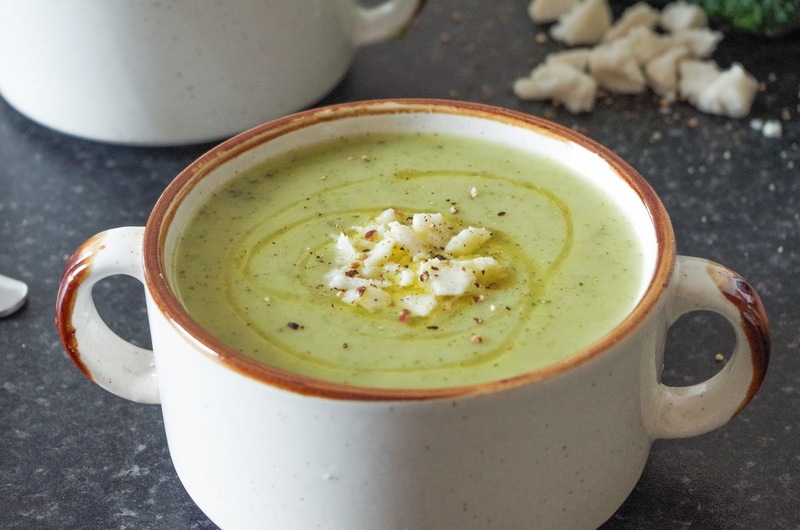 Now that England has decided summer is officially over, it feels like the perfect weather for a bowl of creamy, warming soup as you snuggle up in your duvet and watch the rain outside your window. 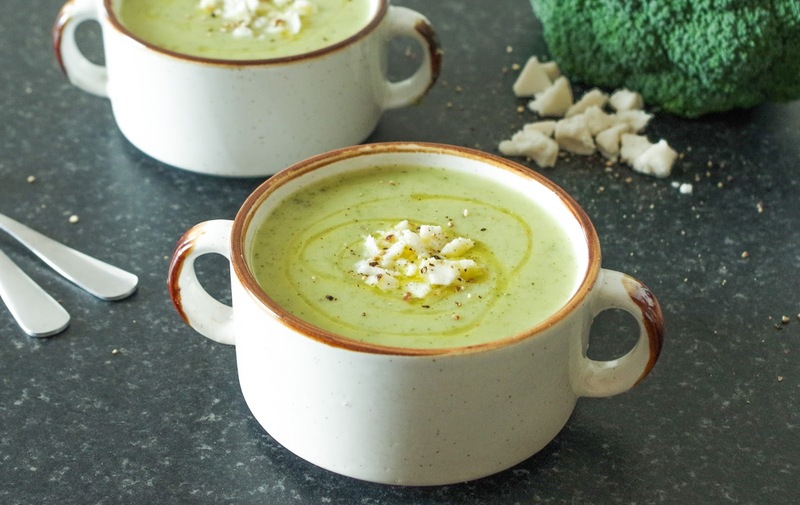 I absolutely love creamy soups, the blu cheese and potato provide creaminess in this soup, with the traditional sour tang the cheese brings, this soup could easily pass for it's dairy counterpart. The blu cheese is obviously dairy free, but it is also free from gluten, wheat & soya, making it also a great option for allergy sufferers. 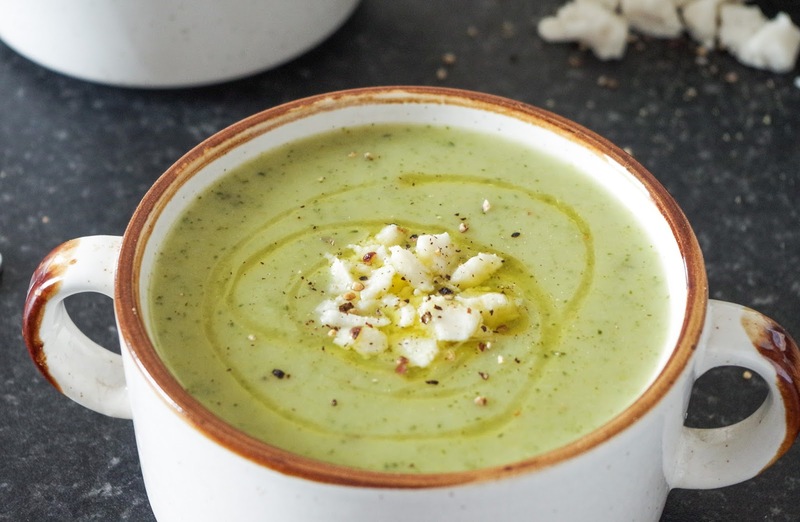 This soup is so rich and creamy, it warms you through and is truly comfort food, perfect with some crusty bread dipped in. You might think that such an indulgent soup wouldn't be healthy, but this soup is also really nutritious; rich in fibre, vitamin E, A, manganese, vitamin B1, potassium, zinc, calcium, iron, copper and so many other vitamins and minerals. The Violife Blu also has the addition of vitamin B12, so I blended the cheese in at the last minute, as to not cook the cheese and maintain the B12 content. B12 is such an important nutrient in our diets, for energy and nerve regulation and whilst some foods are fortified, to ensure you definitely get enough, and do not become deficient, a daily supplement is recommended. Dice an onion and fry on a medium heat for a few minutes. 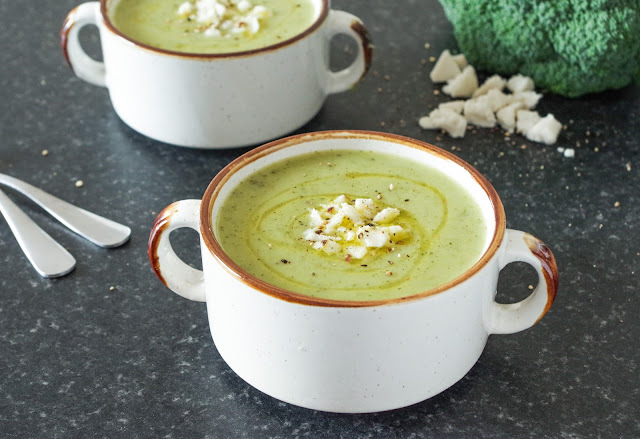 Crush in 2 cloves garlic, then slice the celery and also add this in. Peel and dice a large potato, and stir this in to the pan, with 1 tsp dried thyme and 2 bay leaves and 4 tsp vegan bouillon, cover with hot water and boil for 10 minutes. Prep the broccoli, by chopping up the florets and placing to one side. Carefully remove the outer parts of the stalk, then slice up the tender middle. Add the broccoli and stalks to the pan and simmer for a further 10 minutes. then remove the bay leaves and blend up the soup. Crumble in the blue cheese and blend again, then season with salt and pepper. Serve the soup with a drizzle of olive oil and a good amount of black pepper and enjoy!